While re-organizing the huge mess in the cabinet which houses all of my muffin tins, pie, tart, and assorted sheet pans, I came across a mini-popover pan, wrapped in plastic with the receipt taped on it, from the year 2000. I must have meant to return it, but obviously, I never did. Instead, I packed it and moved it from our condo in Orange County, CA to our apartment in downtown Seattle, to our house in Bellevue, WA, and back to Southern California, first to an apartment and then to our current house, still wrapped in its original packaging. Apparently, thirteen years ago, I wanted to make popovers. Now, looking at the pan, I had two choices: either put it in the giveaway pile or finally unwrap and use it. 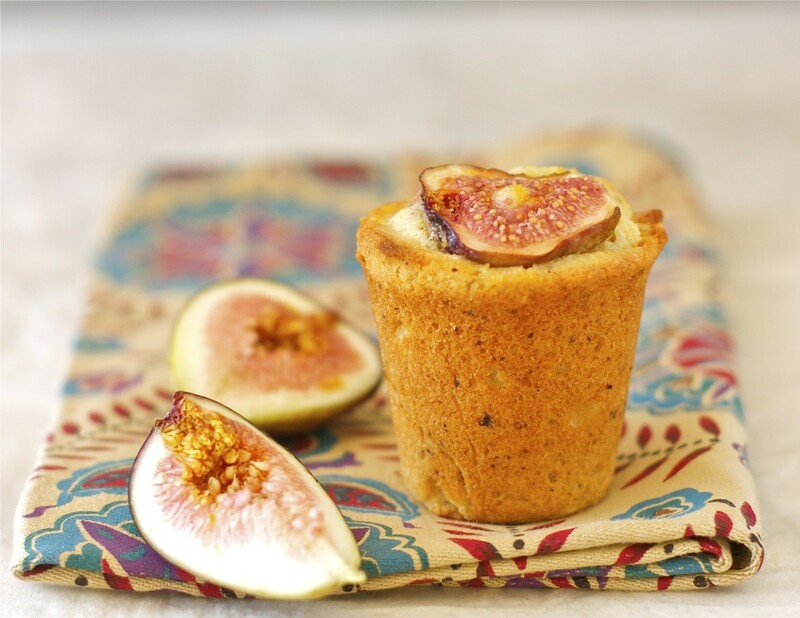 I started searching for a recipe for popovers, but found this one for fig cakes first. So, I used my “new” mini-popover pan to bake these cute mini cakes and they turned out beautifully. I love their shape, which you don’t often see in baked goods. I love baking little cakes like these because they’re so playful and fun to eat! Along with their pretty appearance, they tasted great, as well. 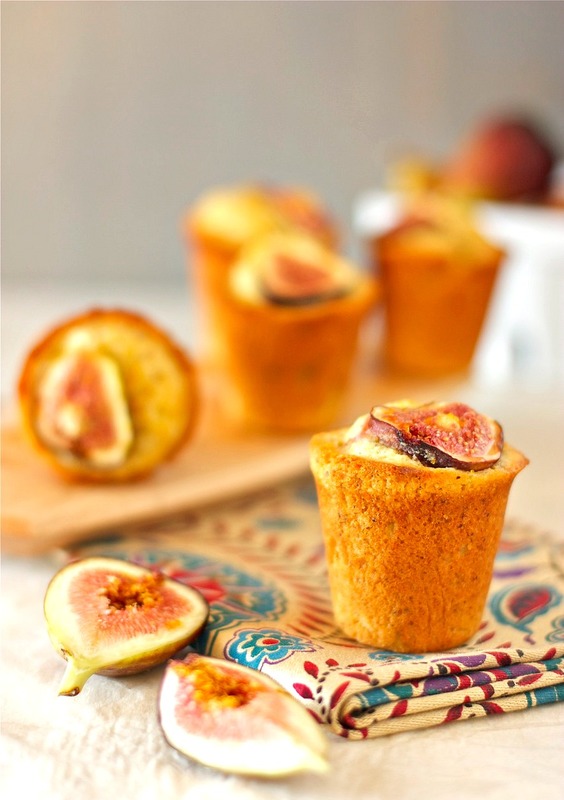 Figs and honey are a great combination and paired well in these moist and flavorful cakes. The orange zest provided a citrusy brightness to them while the addition of hazelnut flour added some texture and nutty flavor. These little cakes are perfect for breakfast with a cup of coffee or served with scones and other sweets for afternoon tea. Now, if any of you have a recipe for popovers, please pass it along so I can use my pan the way it was intended. Preheat the oven to 400 degrees F. Spray mini-popover pan with non-stick baking spray. Set aside. Combine the sugar and orange zest, pressing down with a spoon to release the oil from the zest. Cream the butter and sugar/orange zest mixture until creamy, about 5 minutes. Add the eggs one at a time and beat until smooth. Add the vanilla extract and stir to combine. Whisk together the flour, hazelnut meal, salt and baking powder in a small bowl. Add the dry ingredient mixture all at once to the egg mixture and beat to combine. Cut 3 figs into quarters and cut the remaining 6 figs into 4 slices. 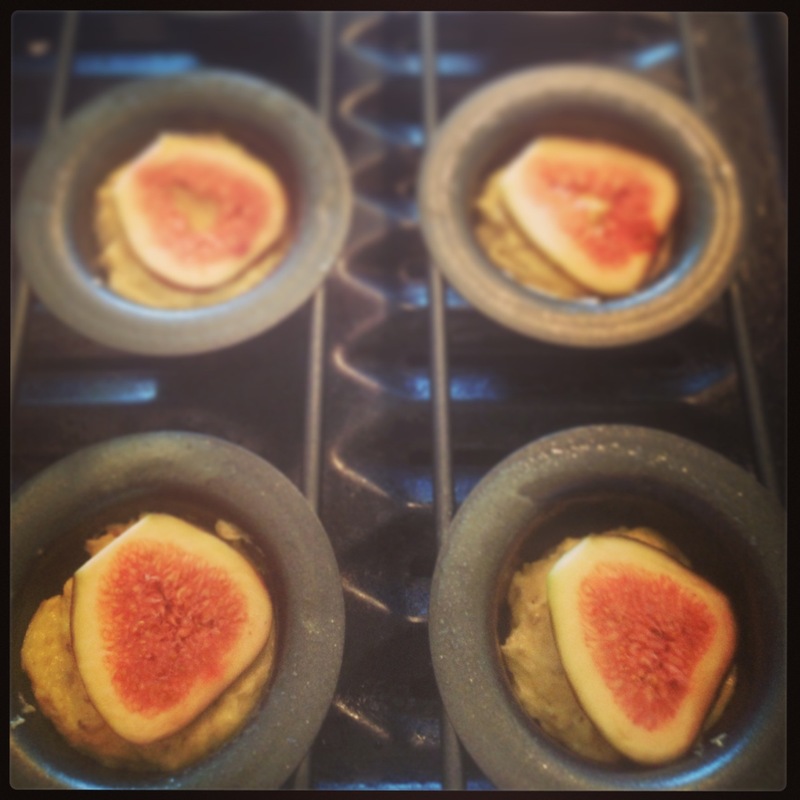 Fill the molds equally about 2/3 full and submerge a fig quarter into the batter. Arrange two slices on top of the batter. Bake for about 16 to 18 minutes or until the cake is just firm. Allow to cool for about 10 minutes then invert the popover pan to remove the cakes. While the cakes are cooling, stir together the honey and orange juice until well combined. Brush the orange honey generously over each cake. Cakes can be served warm or at room temperature, perhaps with a dollop of mascarpone cream and chopped walnuts. Recipe adapted from Suzie Sweet Tooth. I keep looking at these photos and just keep falling in love with them. Das muß eine Geschmacksexplosion sein, yummy . . . While a muffin tin would work, with adjusted cooking times, these cakes baked in popover pan makes a nice and different presentation. Thanks for pinning and sharing with your followers. This looks so good and innovative!! Lovely recipe and really excellent photographs. Susan, I never knew popovers and Yorkshire puddings were the same thing! I love the food blogging community because I am constantly inspired by and learn from my fellow bloggers. Thanks for the tips on making them and pointing out some good recipes. Very lovely shape and the baked fig on top is an attention grabber for sure! You lived here in Seattle?! Nice. Yes, I lived in Seattle/Bellevue for about 2 1/2 years and worked at UW. Seattle is a wonderful city! Thanks, Jen! I’m going to be baking a lot more cakes in this pan since they come out gorgeous. Gorgeous! I’d really love some of those little pots! Daisy! What a riot, moving the popover tin from location to location. I’m glad you kept it. Popovers were one of my favorites. I find them magical. (Yes, chemistry in action, but they DO look magical, and hold gravy like a superstar. This looks like a really elegant dish and a good one to use for our fig bounty that’s going on. Well done! Thanks, Janet. Now I’ve got to make magical popovers. Yes, it’s good I finally used the pan. Only took 13 years to unwrap and I don’t think Walmart would accept the return anyway. LOL! I have a recipe for popovers on my blog! I used a muffin tin, but I suspect they’d be even better with an actual popover pan. Although, those little cakes look so adorable that you might just need to use your pan to make more of them. That’s an option, right? Yes, Zoe! If popovers turn out to be a bust, I’ll keep baking cute little cakes in the pan instead. I’ll be checking out your recipe for sure. Thanks alot for visiting and taking the time to comment.